The coyote flees for protection to behind a guard-rail. The cat keeps an eye on her. Months ago I watched a cat take a walk with its owner. I had never seen a cat do this, but was told that this cat walked regularly like this, and for some distance. Sounds like a uniquely special cat to me. So I alerted the owner that a coyote hung around the area. Yes, the owner knew about the coyote: it turned out that the coyote and the cat had a special, mutually respectful relationship. Yes, I thought, it was a very special cat — or the coyote was a very special coyote. So a few days ago I watched this coyote sniffing for something under the bushes. I wondered what she was sniffing for, until the cat popped out and scared the coyote away. Yes, scared the coyote away. The coyote ran off and found protection behind a guardrail where she waited for that cat to go, but the cat took his time, possibly testing his power over the coyote. He was smart enough not to turn his back on the coyote, but remained facing her. I caught several shots of the coyote’s very worried expression. She looked ready to flee if that cat came towards her. Coyote sits and waits, each waiting for the other to do something. Eventually the cat took off and the coyote, then, proceeded again to sniff for whatever was under the bush. Obviously it hadn’t been the cat the coyote was sniffing out because the cat had gone. This time she came out with something. It was a dead bird, which probably had been left by the cat. 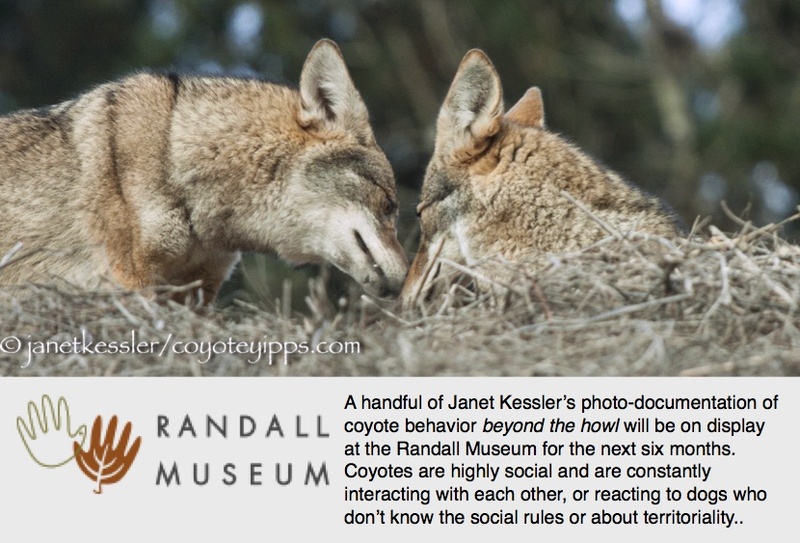 The coyote ate it: coyotes are opportunistic eaters and can eat anything lying around. Coyote goes back for what she had wanted in the first place — it was not the cat, but something left by the cat. So this turned out to be an interesting little triangle: cat, coyote, bird. The cat caught the bird but left it probably because of the coyote’s presence in the bush — even this brave cat appears to know not to get itself too close to the snout of a coyote! Neither animal felt at-ease enough to hunt while the other animal was so close. By the way, many of the animals that coyotes eat are carrion: they were killed by cars or another animal and then found by the coyote. And yes, as you can see, coyotes eat birds. Again, as I’ve stated before, please do not allow your cats to roam free. Coyotes are uniquely individual, each with it’s own unique personality, temperament, habits and even family culture, and you won’t know how a coyote will react to a cat until after the fact. Most coyotes will opportunistically grab a cat if it appears within sight, not run from it! And most cats, left to roam free, will snag little birds.